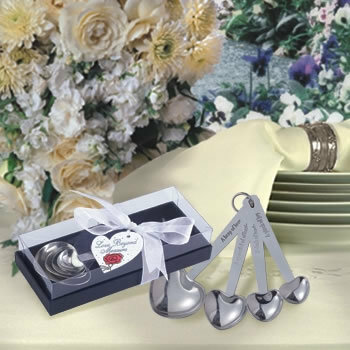 The compliments you'll receive from your guests will last for years when you bestow upon them this whimsical yet so very useful set of heart shaped measuring spoons wedding favor. 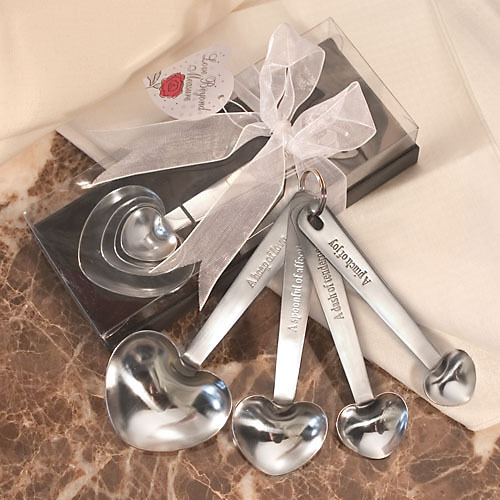 Approximately 5.25" long and made with high-quality stainless steel, these measuring-accurate heart spoons are engraved with traditional measurements on one side and loving notations on the other - "A pinch of joy" - "A dash of tenderness" - "A spoonful of affection" - "A heap of love." These charming favors come beautifully packaged in a matte black box with clear top, white organza bow and a heart-shaped Love Beyond Measure® tag.